Synthetic peptide corresponding to Rat Kv4.2/KCND2 aa 23-43 conjugated to keyhole limpet haemocyanin. Transfected HEK293 cells containing Kv4.2/KCND2.2 cDNA. Our Abpromise guarantee covers the use of ab16719 in the following tested applications. WB 1/1000. Detects a band of approximately 80 kDa (predicted molecular weight: 70 kDa). Highly expressed throughout the brain. Expression is very low or absent in other tissues. Belongs to the potassium channel family. D (Shal) (TC 1.A.1.2) subfamily. Kv4.2/KCND2 sub-subfamily. Cell membrane. Cell projection > dendrite. Detected in dendrites in cultured hippocampal neurons. Association with KCNIP2 probably enhances cell surface expression. 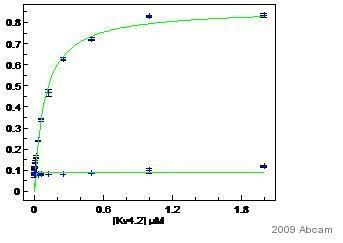 ab16719 detecting Kv4.2/KCND2 by ELISA. The sample was purified from rat neuronal cells and blocked with 1% milk for 1 hour at 18°C. The primary antibody was used at 1/1000 dilution, and incubated with sample for 1 hour at 18°C. Western blot - Anti-Kv4.2/KCND2 antibody (ab16719)Image from Noam Y et al, J Biol Chem. 2010 May 7;285(19):14724-36. Epub 2010 Mar 9, Fig 8.
ab16719 used in Western Blot analysis. The positive control used was prepared from cultured rat hippocampal slices. Lanes containing surface channels were loaded with 3 times the protein loaded for total protein analysis. Publishing research using ab16719? Please let us know so that we can cite the reference in this datasheet.